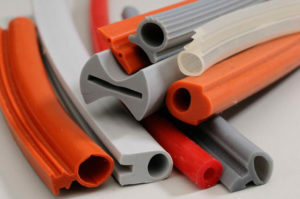 Industrial markets are a major source of demand for rubber trim products, as it is an important material in building insulation and weatherstripping. All commercial and residential builders make use of rubber trim, and the same is true in the automotive industry where vehicle climate control would not be possible without rubber trim insulation. Rubber trim can be found lining the aisles of aircraft, movie theaters, auditoriums and grocery stores. It lines the edges of desks, wall baseboards and refrigerator doors. Rubber trim is so versatile because it can be created in any shape from a variety of raw compositions. It is generally inexpensive and therefore easy to replace. It can be designed to be temperature and chemical-resistant. In applications where trim will be placed in a conspicuous area, it can be embellished during the extrusion process with special designs or patterns. Rubber trim, like all extruded rubber products, must be processed from raw natural or synthetic rubber before it can be used. This is done using a rubber extruder, which is a machine that uses heat and pressure to form the raw material, which is called stock, into a usable product. Most extruders begin with a collection of stock in a hopper that is directed to a conveyance channel. A long screw in that channel moves the stock toward the die, which is a tool that gives the stock its shape. A die can be designed in almost any configuration, so the number of possible rubber extrusions is limited only by the number of possible die designs. In the case of rubber trim, the die may be shaped like a small oval if weatherstripping is being extruded, or it may be thin and wide if the extruder is making wall baseboard trim. As the stock moves toward the die, it is heated and pressurized until it assumes a near-liquid state. It then enters the die, and when it emerges it is cooled and hardens. At this point, the extruded rubber can be cut and shipped, or it can continue for further processing if necessary. In the automotive industry, for example, trim is likely to undergo a strengthening process called vulcanization, because the trim will be subjected to a variety of weather conditions. 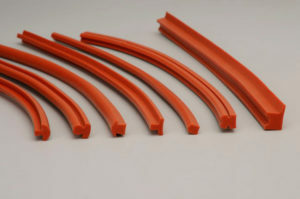 Rubber Trim Rubber trim is a long, often thin variety of extruded rubber that is used in a wide range of applications. Rubber trim can serve both functional and decorative purposes in commercial, industrial and consumer contexts.